A dibble, also called a dibber or a dibbler, is a gardening tool that makes planting seeds, seedlings and bulbs a joy. It makes holes in the soil to a consistent size and depth. If you've never used a dibble, or would like to know more about them, click here to download a PDF file explaining their history and use. We make these dibbles from any of several hardwoods. The material is always salvaged from items others have thrown away: baseball bats, table legs, tool handles, etc. They may be ash, maple, hickory, or oak. Each dibble measures about 1¼" in diameter and 10" long. The spike part is 6" long and is marked every inch so you will know exactly how deep you're planting. The entire length is sanded smooth and finished with mineral oil. Because we use repurposed wood and make each dibble by hand, there may be a very slight difference in shape from one dibble to another. Planting and transplanting is easy with a dibble. To plant seeds, simply poke it straight down into the soil to the desired depth and drop in your seed. If you're planting a row of seeds, drag the dibble to create a trench. To plant bulbs or seedlings, poke a hole to the right depth and wiggle it back and forth to enlarge the hole. You can backfill the holes by poking the dibble around the hole so it caves in. By using the dibble you're not compacting the soil around the roots and you're keeping your hands clean(er). Once your plants are established, stab the surrounding soil to aerate it and make it easier for water to reach the roots. 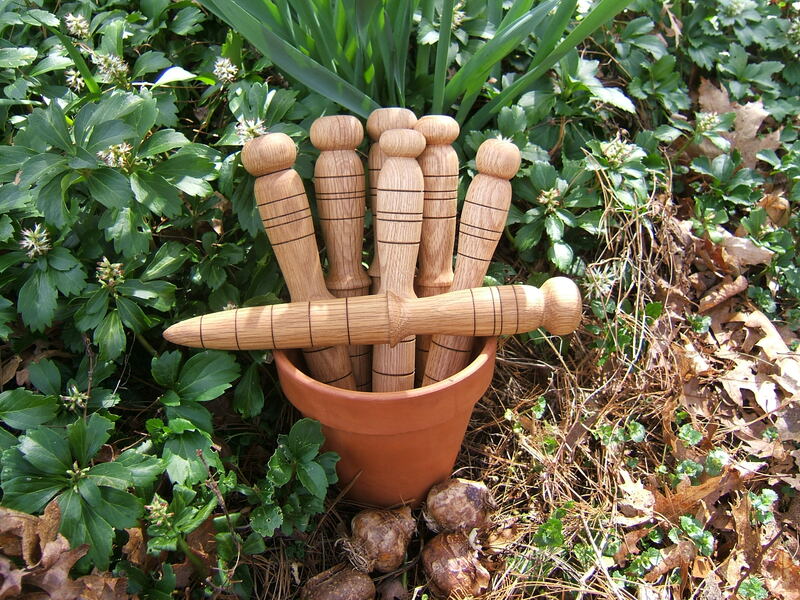 A dibble is a clever gift for any gardener with arthritis, tendinitis or carpal tunnel syndrome. You can use this dibble for hours on end and not have a sore wrist at the end of the day. In fact we've sold a lot of these to commercial greenhouses. They understand how versatile and practical these dibbles are. Each dibble has a leather loop in the handle but before hanging it up, we suggest wiping it clean with a damp rag. Every so often you might also give it a coat of mineral oil.